Hello! I've got exciting news that I've been dying to share with you all ... 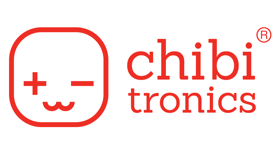 I'm on the Chibitronics Design Team! When I think of the most innovative products that set your cards apart, Chibitronics lights are at the very top of that list. 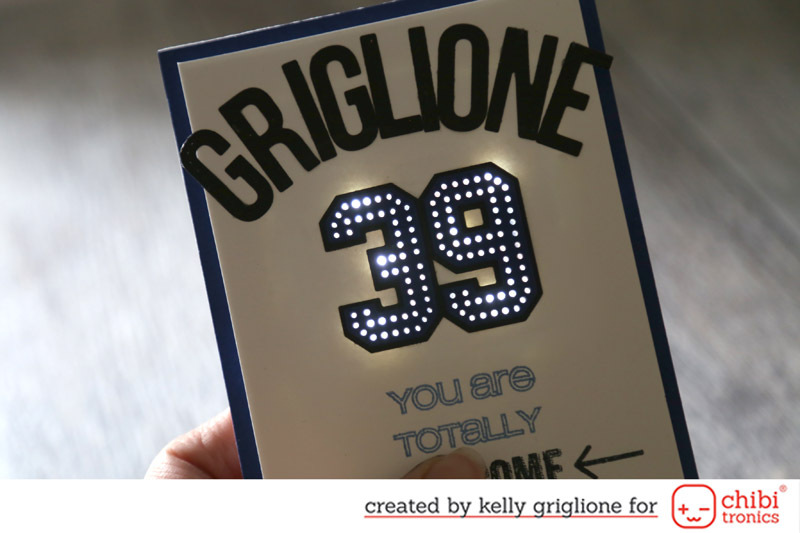 I mean c'mon, how amazing is giving someone a card that LIGHTS UP?!? The first is one I made for my son's 13th birthday this weekend. [side note: any advice on parenting teens is greatly appreciated!] 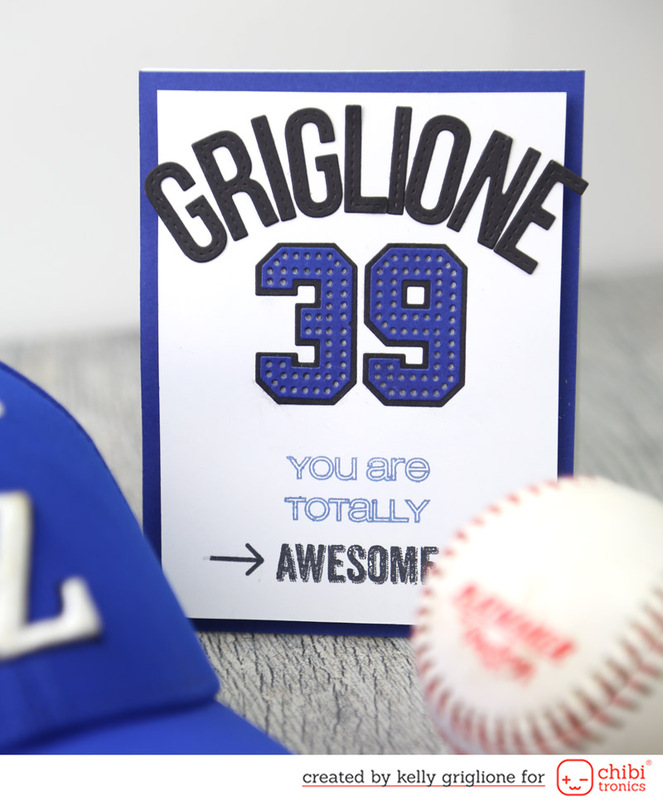 He loves playing baseball so I made a card that replicates the back of his baseball jersey. I've had these Letterman Stitched Number Dies and Mats from Papertrey Ink for years and never used them because stitching seemed like a large time investment. But now, all the wonderful holes seemed a perfect way to let a lot of light shine through. Here's a tip: Use two layers of paper to avoid seeing the card's mechanics when lit. This is what it looked like before I tore the top layer off to remake it with a less see-through property. No one wants to see your underwear foam tape! This card I made several years ago. The original intent was to hold it in front of a window to reveal a hidden message. But who wants to do that, when you could just have it light up when you press on "birthday"?! So I remade this card with the new Chibitronics technology. 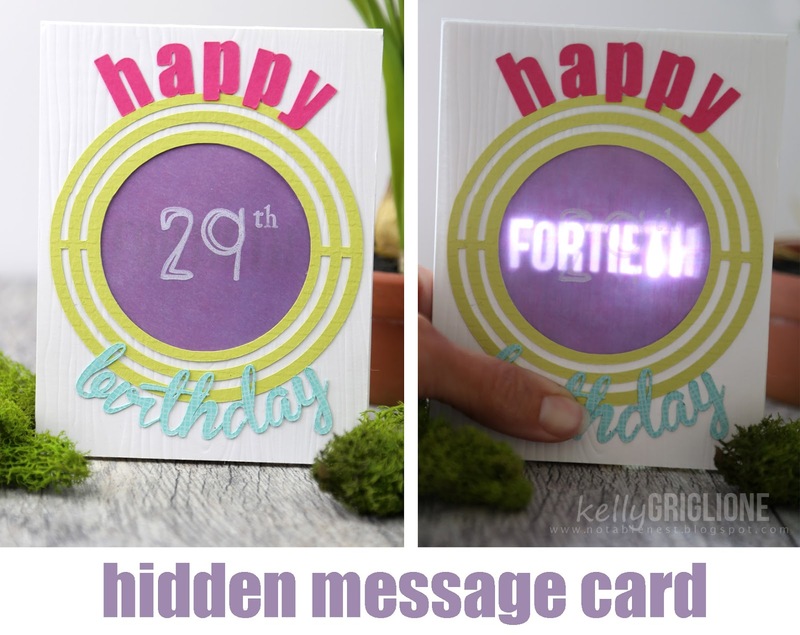 Now there is no hiding from the real purpose of this card ... to wish a happy 40th birthday! 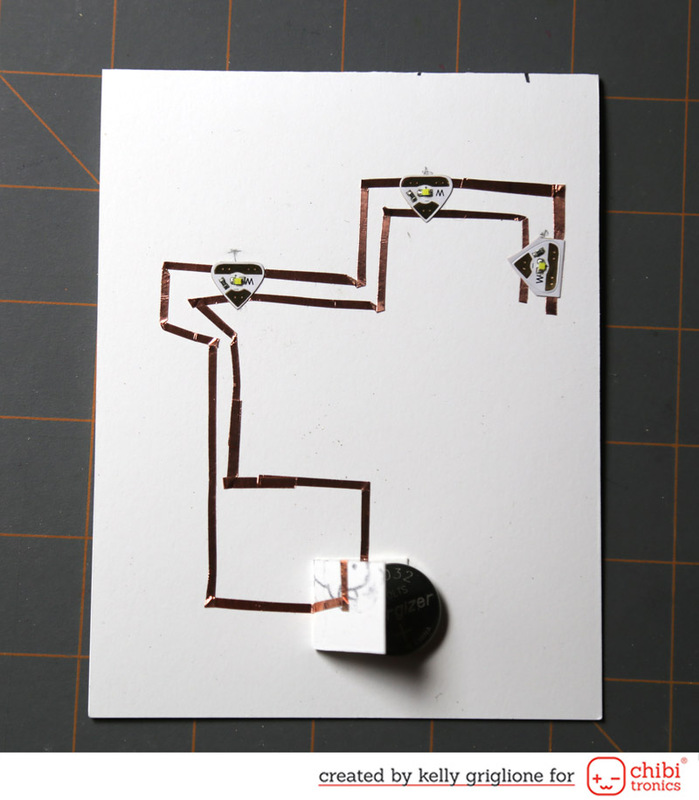 In general, you create a circuit out of copper tape that runs from the battery and back. 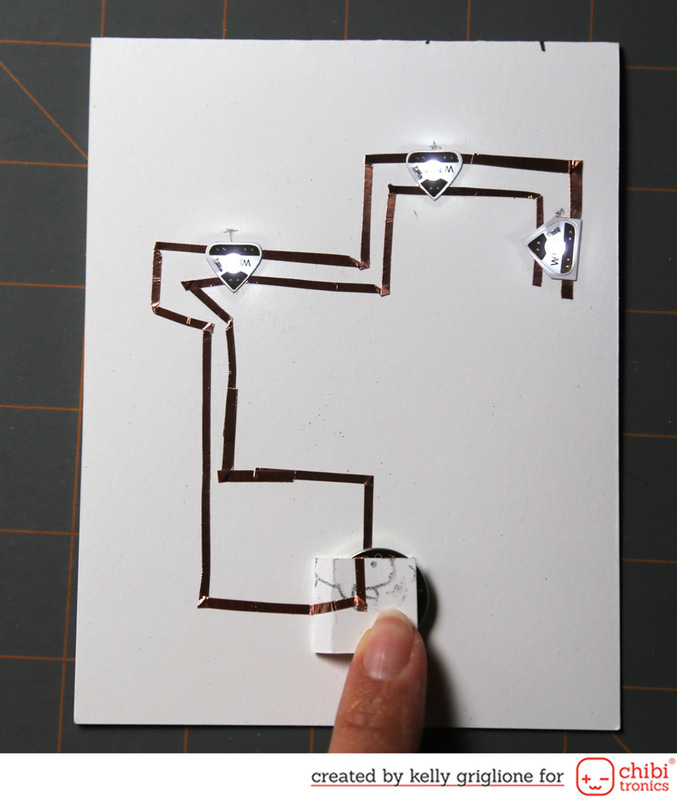 When you press on the battery housing (the folded piece of paper here) the circuit is complete, and then the lights go on. When there is not pressure, and the copper tape is not touching the battery, the circuit is not complete and the lights do no go on (like in this photo). Press the flap down to close the circuit and ta-da!!! There is light! 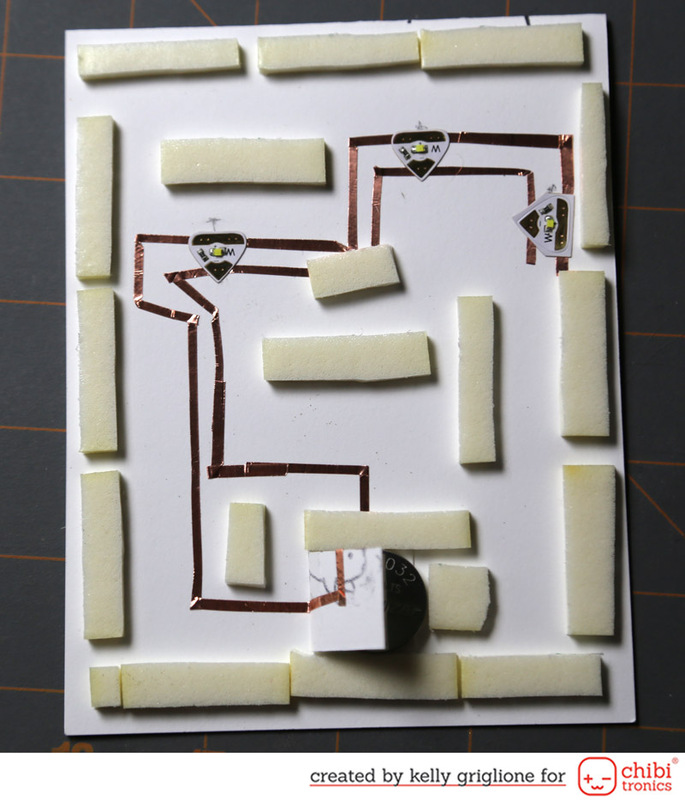 Then you use a generous amount of foam tape to lift the card base so the flap doesn't touch the copper tape, which would complete the circuit and turn the lights on. 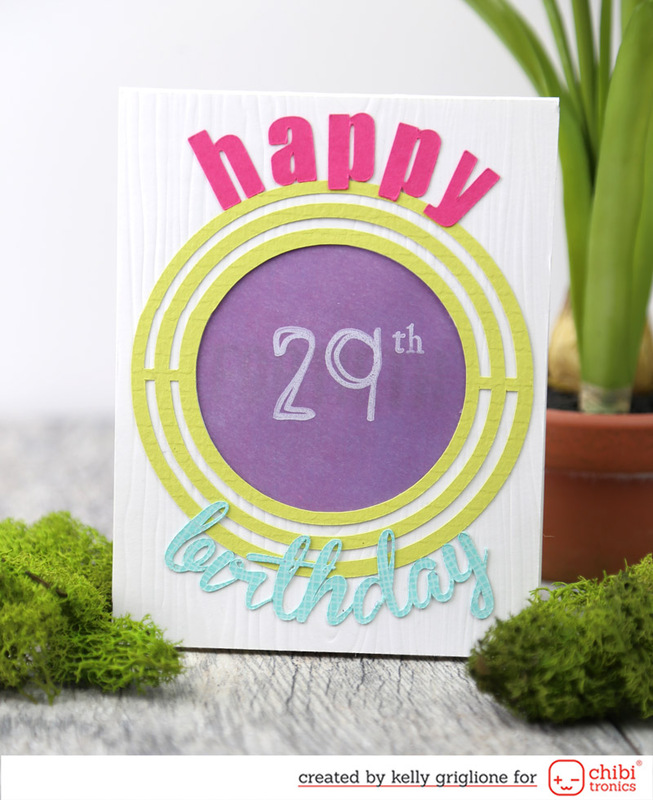 I am so in love with this product, and all the possibilities it gives us cardmakers, and couldn't be more thrilled to be on the design team. Playing around with this technology makes me feel like an engineer (which amuses my husband to no end since he really is an engineer!) We have a ton of exciting things coming up this year that I can't wait to show you all. 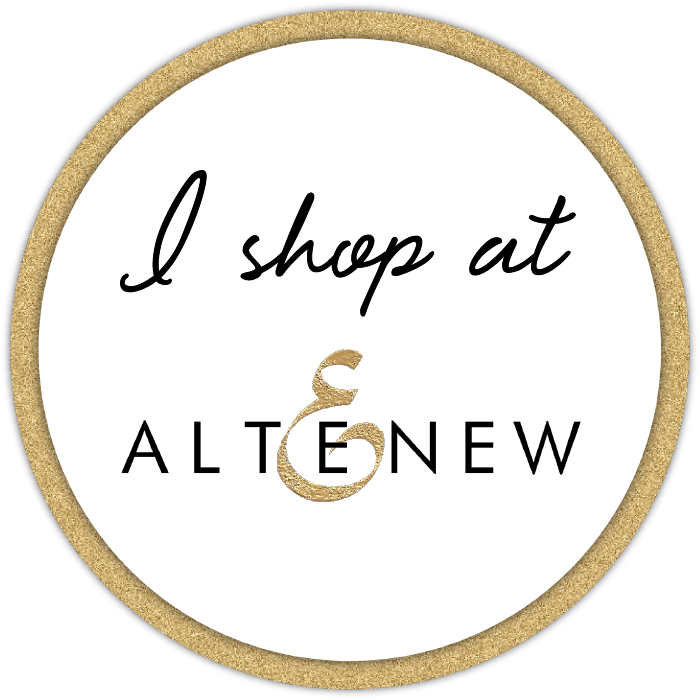 Stay tuned for one coming up in the next couple weeks!! Thanks for stopping by and sharing in my excitement! CONGRATULATIONS Kelly!! You are a perfect match for this team with all of your awesome creativity!! Fun cards!! That's so cool, congratulations!!! 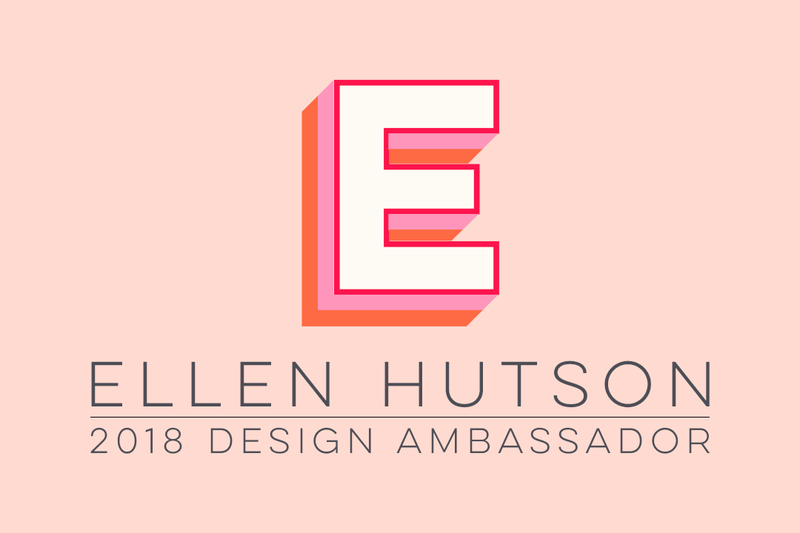 Can't wait to see your amazing designs come to life! Congratulations, Kelly. You have such a clever mind that I'm sure your engineering will bring us fantastic cards. 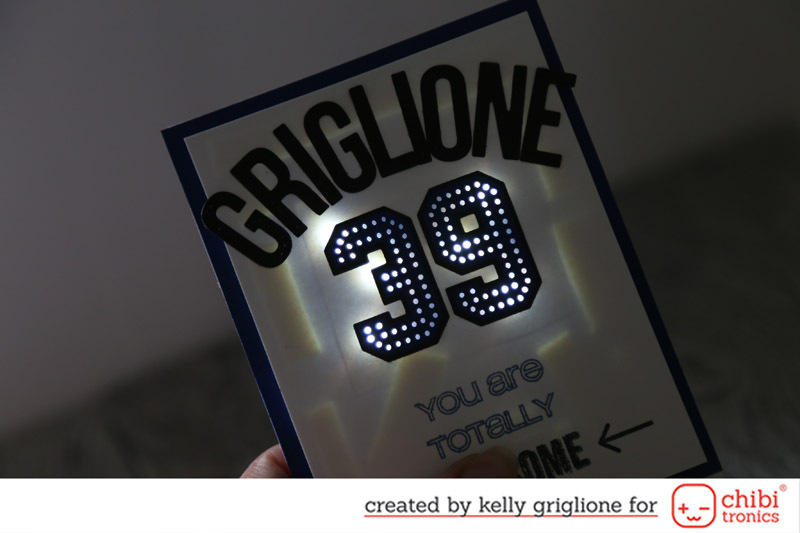 Lighting up that stitched number was just the start. As for teen advice (and mine haven't been teens in decades) "Keep the lines of communication open and be willing to discuss anything". This team is perfect for you! I am really excited to see all the stuff you come up with, you are so clever and I know it is going to blow my mind. No pressure. Ha!